PUNE: The Indian Air Force has ordered a court of inquiry into the incident of a Sukhoi jet developing technical problems on Friday morning at Lohegaon Air Force Station. “The inquiry panel will carry out a detailed investigation into the matter to find out the technical issue of the aircraft. Since the fighter jet is equipped with several systems, it is difficult to pinpoint the exact issue at this juncture,” a senior Indian Air Force (IAF) officer from New Delhi told TOI over phone on Saturday. The panel will comprise an experienced presiding officer, a technical member and a flying member. “The inquiry panel will investigate the real-time conversation between the two pilots in the cockpit. It will also verify if the pilots followed the emergency standard operating procedure (SOP) and many other issues pertaining to it during the investigation,” said the officer. Sukhoi 30 MKI is a twin-engine aircraft. It is operated by two fighter pilots. “The aircraft engine switches off in an extreme circumstance such as a fire in the engine or hydraulic leak among others. In such a situation, the captain of the aircraft takes command of the aircraft and provides information to the air traffic control (ATC) officer. If there is adequate time, the ATC, with the help of ground crews, clears the runway for aircraft landing,” said another IAF officer, who did not wish to be named. 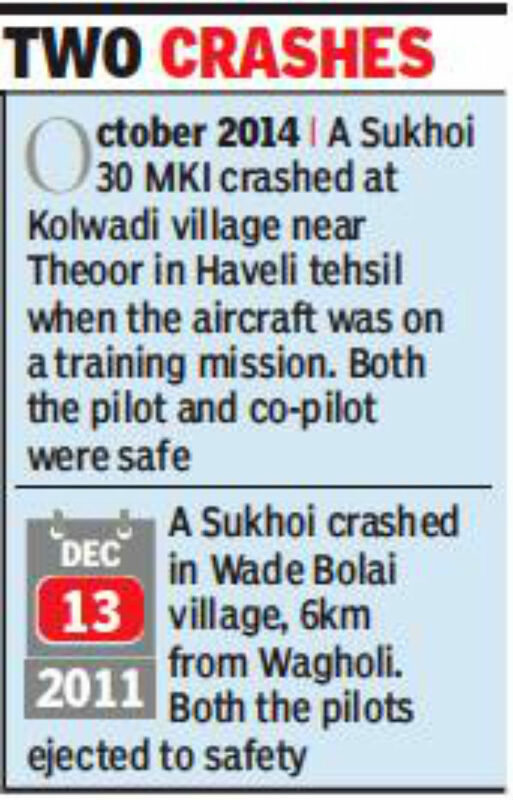 The officer said as far as the Sukhoi is concerned, if there is an issue in the port engine then the pilots cannot operate the aircraft’s hydraulic system — the key for smooth landing. Air Officer Commanding (AOC) of Air Force Station (AFS) Lohegaon refused to comment on the matter. He did not reply to text messages nor answered calls till Saturday evening.